Originating in Leonberg, Germany in 1846, this versatile breed was a favorite with royalty. The Leonberger nearly became extinct at the end of World War I but was revived and restored by several German breeders that were devoted to the breed. They are considered to be the oldest of the German breeds. Leonberger's continue to be used as a working breed and companion in Germany, France, Scandinavia. However, they are relatively rare in other countries. The Leonberger breed is elegant, large, and powerful. This breed possesses a gentle expression and an impressive and regal appearance. Leonberger's are sturdy, well-built, and highly reliable. A breed regarded as a "gentle giant", the Leonberger is affectionate, loyal, devoted, and trustworthy. This calm and steady breed is excellent with children, dogs, and other pets. They do not do well if left alone for extended periods of time and will bark and become destructive if bored or lonely. They are gentle, protective, and self-assured. They require a highly dedicated owner. This is a high maintenance breed. The Leonberger requires daily brushing to remove loose and dead hair and minimize shedding. Special care should be given during seasonal blowing of the coat. Bathing should be done when necessary. It is important to regularly clean the ears and provide good dental hygiene. This breed has a relatively short life span. They are prone to such health issues as hip dysplasia, OCD, Addison's disease, entropion, ectropion, osteosarcoma, bloat, and hypothyroidism. Leonberger's may be sensitive to some drugs such as sulfa, tranquilizers, and anesthetics. The Leonberger is a double coat breed. The outer coat is long, profuse, and straight. The under coat is thick and dense. There is a mane of hair on the chest and around the neck and feathering on the front legs. The hair on the breeches is profuse and thick. This breed is continuously heavy shedding with seasonal blowing of the coat. Early socialization and obedience training is required. The Leonberger is intelligent and eager to please. They will not respond to harsh or heavy-handed methods. Training must be done with respect, fairness, firmness, patience, and consistency. The Leonberger is not recommended for apartment living. They require daily exercise, family interaction, and mental stimulation. This breed does best in a large securely fenced yard or rural setting. 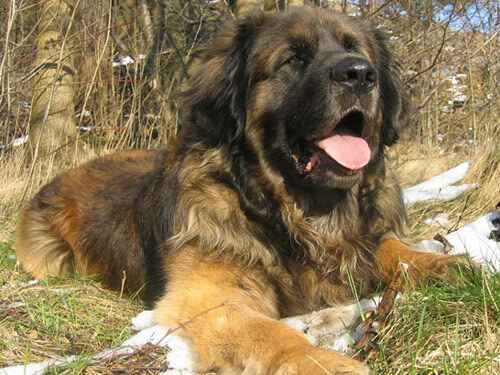 Leonberger's enjoy swimming, hiking, backpacking, running, and family activities. They excel at agility, tracking, therapy, and water rescue.